Director Paul Feig is still riding high on the success of his 2011 breakout comedy hit “Bridesmaids” – a film that not only cemented his place in the comedy realm, but also helped catapult one of its stars into super stardom. Yes, I’m talking about Melissa McCarthy. So it would only make sense that this dynamic duo re-team for Feig’s follow up comedy “The Heat,” starring McCarthy and another very funny lady Sandra Bullock. “The Heat” is a story about an uptight and straight-laced FBI agent named Sarah Ashburn (Bullock) who is a methodical and calculated investigator with a reputation for excellence and hyper arrogance. This has hindered her work environment and so not only does she not have any friends, she has never been able to keep a partner. All that changes when she is paired with a foul-mouthed and short-fused Boston cop named Shannon Mullins (McCarthy). Mullins plays things fast and loose and has a tendency to lose her temper, but she seems to be one of the finest cops in the city and she always catches the most elusive criminals. These two incompatible personalities must join forces and learn to work together to catch a ruthless drug lord. Their personalities will clash, but maybe they can learn a thing or two from each other. A new international trailer has just been released for the film and it doesn’t have much new footage compared to the first trailer, but it is unrated and therefore includes more of the foul jokes you will be seeing in the film. Try to ignore the boring ‘90s style voice-over and enjoy the funny trailer. My first thoughts on this trailer are that while it seems pretty hysterical and the chemistry between the two is working well, there are so many similarities to other projects from McCarthy and Bullock’s past I find myself thinking about those other movies when I should be focusing on this new film. Right off the top, we have seen Sandra Bullock in the uptight F.B.I. role before, as Gracie Hart in the “Miss Congeniality” films, and although those were funny and pretty successful, I would like a broader range of characters for her to play. The other major comparison I had for Melissa McCarthy is not for a past film, but another upcoming project she is in with Jason Bateman called “Identity Thief” in which she has the same over-the-top personality, but instead of catching criminals she is one. 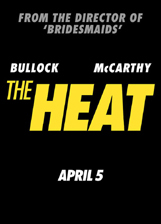 The worst part of comparing these two films is that “Identity Thief” will be in theaters sooner and “The Heat” will largely depend on how audiences like McCarthy’s performance and could really benefit or hurt the appeal of audiences to see “The Heat” in theaters. I do think both Bullock and McCarthy are very talented women who each have a particular style of comedy that they succeed at, each has their own fan following that will support all of their endeavors and “The Heat” should be no different. While I can’t fully give judgment on the movie until I see it, and I really do hope it is a fraction as funny as “Bridesmaids” because that was the funniest film of 2011 in my opinion. “The Heat” hits theaters April 5 and although the MPAA has yet to give it an official rating it will more than likely be rated R.
← Is the Force with J.J. Abrams? I think it’s strange that the poster just says “McCarthy.” I think most people would realize who “Bullock” is, but I’m pretty sure studios are over-estimating Melissa McCarthy’s name recognition (and box office appeal at this point).